I simply can't waste any of the Embossing Paste, so when I colour a bit too much for a project - I use it up with a variety of stencils. So... I have quite a few Embossing Paste backgrounds sitting on my desk! 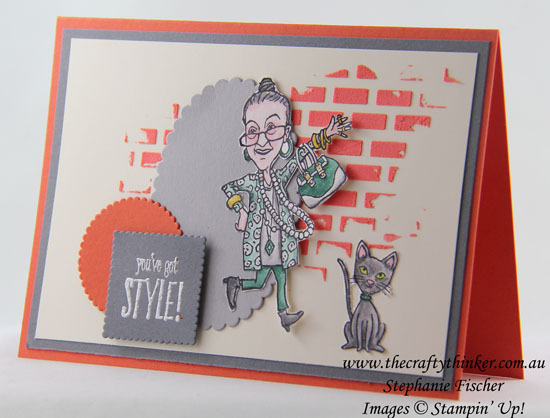 This background came about using up excess Tangerine Tango paste from making this card. 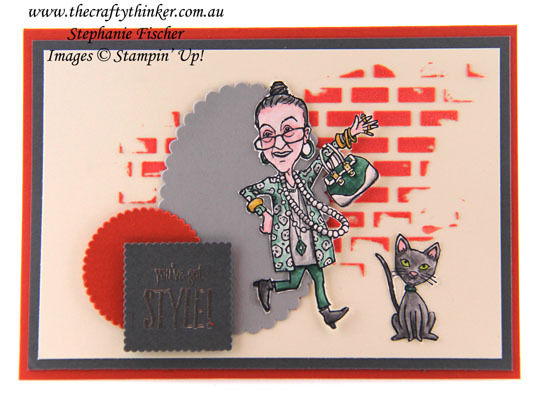 Mini Stampin' Dimensionals are holding this lady's extremities up from the card background. The cat, typical of its species, doesn't look too impressed! So - what to do with a background when inspiration isn't striking? Try adding some geometric shapes in coordinating colours. What do you think is going through the cat's mind? Do share your ideas in the comments area below.